Admittedly, the use of Facebook in education is a contentious topic that raises a lot of controversy and debate among educators. Some view it as irrelevant social media platform to be used in educational settings, the other camp sees a potent tool with a conceivable educational potential. Certainly, as a social media website, Facebook poses some serious caveats that teachers have to attend to. Issues of safety, irrelevant content, distraction, vulnerability…etc are some of the things to be addressed with students before incorporating Facebook in any instructional methodology. 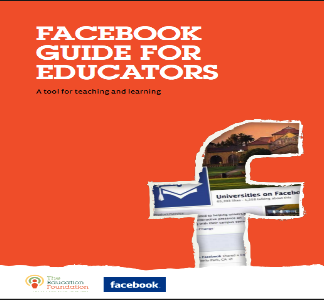 We would also recommend this wonderful free guide for those of you who want to have a profound look into how to effectively integrate Facebook in class. This 20-pages PDF features a variety of tips, strategies and insights on how to use Facebook as a tool for teaching and learning. Here is a snapshot of its table of content and you can download the guide from this page. Thanks go back to Kristen Winkler through whose post we learned about this resource.